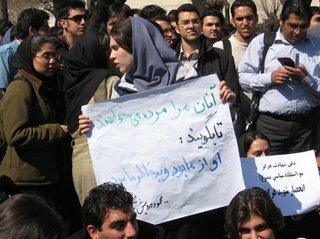 Thousands of students at Sharif University, Tehran, are protesting at attempts by the authorities to bury empty coffins in the university grounds. The Iranian authorities are claiming these are the coffins of the Iran-Iraq war martyrs. Such burials have become a routine procession by the authorities to exploit the genuine feelings, the Iranians have for their martyrs who sacrificed their lives and defended Iran against the Iraqi aggression, 18 years ago. Burying these empty coffins in the university campus also gives the Baseej members an excuse for being present at the university campus, under the pretence of paying respect to the war dead, but in reality the presence of the Baseej is to implement an atmosphere of fear and terror in the campus. The large placard above says "They like me dead so they can say, 'he was one of us and died for our sake' "
The smaller placard says "Stop political exploitation of our martyrs - Stop monopolising the Martyrs". I believe the Student Movement is not dead! That is one of the signs of their vibrant activities!